Before reading this article, it is best to first read this short piece so that you understand the fundamentals of muscle growth. This article focuses on the latter-most requisite – protein intake. Protein is the most essential macronutrient for muscle growth. Fat and carbohydrates, while less essential to the specific process of muscle growth, are also crucial because they contribute to a caloric surplus and provide fuel for other essential metabolic needs. However, protein is the only macronutrient that can be used as a “building block” for muscle tissue. Protein and carbohydrates can be transformed into stored fat tissue, and protein and fat can be transformed into carbohydrates for energy, but carbohydrates and fat cannot be transformed into protein. The exclusive nature of protein makes it a prime commodity in the business of muscle growth. The anabolic journey of protein can be summarized as “Complex-to-Simple-to-Complex”. When dietary protein is ingested through the mouth, it exists as a collection of complex molecules. As protein undergoes digestion in the stomach and small intestine, it gets broken down into simpler amino acids, which are the constituents of complex protein molecules. The fun-sized amino acids are highly mobile and can easily cross the barrier between the small intestine and the blood stream. After crossing into the flow of the blood stream, the amino acids travel peripherally through the circulatory system and get delivered to muscle tissue where they are utilized in muscle protein synthesis – the most fundamental process of muscle growth that occurs on a cellular level. During muscle protein synthesis, amino acids undergo a process of accretion and get transformed back into complex protein molecules, but this time in the form of muscle tissue. Complex-to-Simple-to-Complex. † Individual unmodified photo of circulatory system by Eric Villalba. †† Individual unmodified micrograph of skeletal striated muscle (right fibularis longus), HPS stain, by Copyright © 2013 Michael Bonert. A positive net energy balance is necessary for muscle growth to occur. That is, you must consume enough food so that your daily caloric intake exceeds your daily energy expenditure. In addition to having an overall caloric requirement for muscle growth, the body has a specific protein requirement as well. To understand why the body needs a certain amount of protein for muscle growth, we will use the same “net gain of the system” concept. MPS and MPB are continuous physiological processes, meaning that the body is simultaneously building up and breaking down muscle tissue at all times . The net result between these two opposing processes is what dictates muscle gain or muscle loss. It should be noted that MPB is not bad, as it is necessary to breakdown old, damaged muscle tissue in order to replace it with healthier, more resilient tissue . Muscle growth is optimized by increasing MPS and minimizing MPB. By understanding the relationship between muscle protein synthesis, muscle protein breakdown, and net protein balance, we understand that the body requires a certain amount of protein to elicit a net gain in muscle tissue. The question now is, “What is the optimal amount of protein to eat in order to facilitate muscle growth?” The rest of this article attempts to answer that question by breaking down current scientific evidence on the matter. There is no hard and fast rule that dictates how much dietary protein is required to optimize muscle growth, and much debate surrounds this topic [2-5]. Optimal protein consumption is based on several factors that can vary considerably between individuals. Such factors include: goals, genetics, gender, age, bodyweight, body composition, overall physical activity, and mode of training (e.g. endurance-based or strength-based). The debate surrounding protein requirement is somewhat inane, as much of it is based on a confusion of concepts. Some scientists define protein requirement as the amount of protein necessary to prevent deficiency, and others define it as the amount of protein necessary to optimize function [2,5,6]. The minimum amount of dietary protein necessary to maintain lean body mass and basic metabolic processes involving protein and amino acids. 6.) Support the optimal rate of production of all plasma proteins required for optimally physiological function, would the previous estimates of protein intake represent an optimal level?" Clearly, if the goal is to optimize function, protein intake will be greater than the amount necessary to prevent deficiency. It’s also important to note that the comparatively low protein recommendations for deficiency prevention are largely based on a method called “nitrogen balance”, which has been shown to be an unreliable way of measuring protein needs [4-6]. Since this article investigates the relationship between protein consumption and muscle growth, we will focus on protein requirement for optimized function. First, let’s start with the absolute basics. Individuals attempting to gain muscle mass through a combination of strength training and a hyper-caloric diet require more protein than endurance athletes and sedentary individuals [2-4,6-8]. Based on the most recent scientific evidence, the recommended range of protein intake for adults wanting to optimize muscle growth is 1.2–2.0 grams of protein per kilogram of bodyweight [3,4,7], which approximately equates conveniently to 0.5–1.0 grams of protein per pound of bodyweight. The higher end of the range is recommended for individuals whose primary training goal is gaining muscle mass. For the sake of comparison, the recommended protein intake for preventing deficiency in adults is 0.8 grams of protein per kilogram of bodyweight, or approximately 0.35 grams of protein per pound of bodyweight . The upper end of the recommended range of protein intake for optimizing muscle growth is almost three times greater than the recommended intake for preventing deficiency. There are claims that consuming large amounts of protein can be detrimental to health by excessively taxing the kidneys. However, for adults in good health with no pre-existing kidney problems, there is no evidence that a high protein diet is associated with adverse health outcomes [2,4]. High protein consumption may become a problem if other nutrients (e.g. fat, carbohydrates, fiber, and vitamin-dense foods like vegetables) are forgone to allow for excessive protein ingestion (i.e. 40% or more of total caloric intake). In other words, there is only so much food that can be eaten in a day, and overall nutritional balance should not be undermined in favor of eating extreme amounts of protein. For example, protein is the building block of muscle tissue, but carbohydrates are the primary fuel source for resistance training, and therefore both macronutrients must be consumed in sufficient amounts. As we know from the beginning of this article, resistance training and protein intake play equally important roles in the process of muscle growth. Overall protein consumption (i.e. grams eaten per day) is a foundational consideration if your goal is to gain lean body mass, but there are several other factors to take into account if you truly want to optimize protein intake for muscle growth. This section breaks down such factors. The following information is intended for those seeking optimization; it may seem logistically intensive and perhaps challenging to practically implement on a daily basis. Please know that the following considerations are not necessary to achieve gains in lean body mass, but they are necessary if your goal is to take full advantage of your body’s capacity to build muscle. The majority of your daily protein intake should come from high-quality sources . The concentration of essential amino acids (EAAs) is what differentiates high-quality protein from low-quality. There are 20 total amino acids, 9 of which are deemed essential because the body cannot synthesize them. The only way the body has access to EAAs is through diet. If a protein source is made up of ~40% or more of EAAs, and contains all 9 EAAs, it is considered high-quality . EAAs are important because they play building block roles in the process of muscle protein synthesis (MPS). In addition to being the construction material for muscle tissue, EAAs also stimulate MPS , particularly the EAA leucine [2-4,7,8,10]. *There is evidence suggesting that milk is a particularly effective source of protein for stimulating MPS because it gets efficiently delivered to muscle tissue once ingested, and it contains a relatively high concentration of the amino acid leucine [7,11]. The above list contains examples of high-quality protein sources; it is not meant to be comprehensive. † Individual unmodified photo of soy powder by Tiia Monto. Protein should be consumed within 1 hour after a strength training session in order to provide fatigued muscles with the vital nutrients for anabolism/recovery [2-4,6,7,12,13]. Whey is a particularly effective form of protein for post-workout replenishment because it is fast-digesting and provides readily available nutrients for MPS [7,11]. Strength training and amino acid consumption stimulate MPS independently from each other. However, if consumed within 24 hours of strength training, amino acids deliver a more powerful stimulus to MPS than if strength training were not performed . This is a “whole is greater than the sum of its parts” kind of situation. Practically speaking, protein ingestion is a more vital consideration on training days compared to recovery days because the body is in a more anabolic state in the 24 hours after a training session. This is especially true for individuals who train in the morning. For example, if one trains at 7am every other day, their prime anabolic window is open until 7am the next morning after a training day. Therefore, care should be taken to ensure sufficient protein consumption on training days to capitalize on the synergistic anabolic effect of combining strength training with amino acid intake. Thankfully, science and common sense come together on the answer – protein intake should be spread out as evenly as possible through the day in order to frequently stimulate MPS . Simply eating protein stimulates MPS, regardless of resistance training , and the most effective protein dose for maximal stimulation appears to be 20-25 grams per meal [2,3,6,7]. Protein consumption beyond this recommended range does not appear to further stimulate MPS, although larger individuals will need to consume more than 20-25 grams of protein per meal due to their greater metabolic needs for muscle maintenance/growth. By providing your body with evenly-spaced doses of protein that maximally stimulate MPS, you can achieve a greater positive net protein balance. Practically speaking, at least 20-25 grams of protein should be consumed with every meal, and meals should occur 3-6 times per day depending on lifestyle factors and total caloric & protein needs. From the information provided thus far, we know that a post-workout meal should occur within an hour after training and include at least 20-25 grams of protein, but there is another important consideration – co-ingestion of carbohydrates. When carbohydrates are consumed, insulin is released into the blood stream. One of insulin’s primary responsibilities is to travel through the circulatory system collecting glucose (i.e. blood sugar) and shuttling it into liver and muscle cells to be used for energy later on. However, insulin doesn’t just manage glucose levels in the blood; it is a complex hormone that causes many effects throughout the body, two of which are stimulation of MPS and suppression of MPB . When protein and carbohydrates are consumed together, they create a compounded anabolic effect that stimulates MPS more than consuming protein by itself. In addition, post-workout carbohydrate consumption is critical for replenishing glycogen, a complex aggregation of glucose molecules that is stored in liver and muscle tissue. During intense strength training, glycogen stores are used as a primary energy source and consequently become depleted. Therefore, carbohydrate ingestion fulfills two important purposes – replenishment of energy stores and stimulation of MPS. † Individual unmodified micrograph of skeletal striated muscle (right fibularis longus), HPS stain, by Copyright © 2013 Michael Bonert. The combination of the above factors creates a synergistic intensification of MPS, which optimizes muscle growth. This article provides a comprehensive, evidence-based explanation of how to manipulate protein consumption to elicit optimal gains in muscle mass, assuming that one concurrently engages in a strength training program and eats enough calories to create a positive energy balance. If your primary goal is to increase muscle mass, don’t let your hard work in the gym go to waste by not consuming protein in an optimal way. When it comes to muscle growth, no macronutrient gets as much attention as protein. This is with good reason, as protein provides the molecular building blocks for muscle tissue. Since protein is put at a premium in muscle growth, its consumption gets much attention. Resultantly, there are many opinions on what the optimal range of protein intake is. The U.S. recommended daily allowance (RDA) of protein is quite low (~0.35 grams per pound of bodyweight) because it is meant to prevent deficiency . Conversely, parts of the bodybuilding community promote a protein intake that is quite high (as much as 3.0 grams of protein per pound of bodyweight), likely due to an obsessive concern about gaining as much muscle mass as possible. However, as with many things, the answer appears to lie somewhere in the middle. Current scientific evidence suggests that the optimal range of protein intake for muscle growth in adults is approximately 0.5 – 1.0 grams of protein per pound of bodyweight [3,4,7]. Muscle growth requires a combination of strength training + caloric surplus + positive net protein balance. Strength training is the most effective form of exercise for stimulating muscle growth. Individuals seeking to gain muscle mass by engaging in a strength training program require more protein than endurance athletes and sedentary individuals [2-4,6-8]. Those wanting to gain muscle should follow protein recommendations based on optimization of function, not prevention of deficiency. The recommended range of protein intake for optimizing muscle growth is 0.5 – 1.0 grams of protein per pound of bodyweight [3,4,7]. Those whose primary training goal is gaining muscle mass should consume protein according to the higher end of the recommended range. There is no evidence suggesting that a high protein diet increases the risk of adverse health outcomes, except perhaps in those with pre-existing kidney dysfunction [2,4]. The majority of protein intake should consist of high-quality sources such as dairy, lean animal meat, eggs, and soy [2,3,6-8]. Each meal should contain at least 20-25 grams of high-quality protein [2,3,6,7]. Protein and simple carbohydrates should be consumed within an hour after a training session to maximize muscle growth and recovery [2-4,6,7,12,13]. Protein and calorie intake is particularly important in the 24 hours following a training session, as the body is in a heightened anabolic state during that time . Meals should be spaced evenly throughout the day to provide the body with frequent stimulation of muscle protein synthesis . 1.) Deutz, N. E., & Wolfe, R. R. (2013). 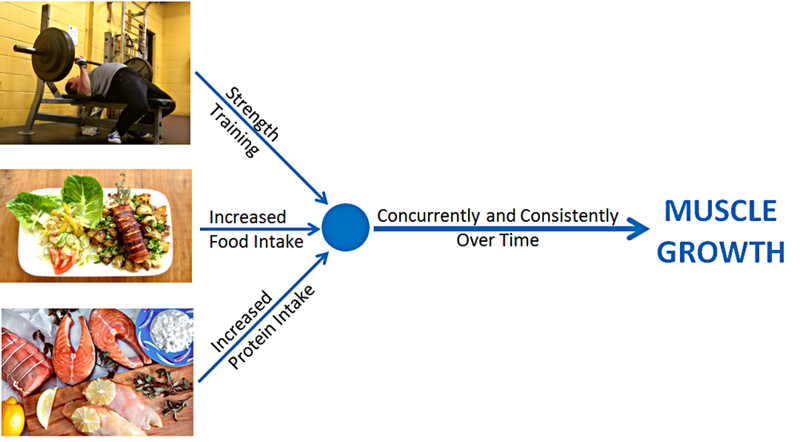 Is there a maximal anabolic response to protein intake with a meal? Clinical Nutrition, 32(2), 309-313. 2.) Phillips, S. M., Moore, D. R., & Tang, J. E. (2007). A critical examination of dietary protein requirements, benefits, and excesses in athletes. International Journal of Sport Nutrition and Exercise Metabolism, 17(S1), S58-S76. 3.) Phillips, S. M., & Van Loon, L. J. (2011). Dietary protein for athletes: from requirements to optimum adaptation. Journal of Sports Sciences, 29(S1), S29-S38. 4.) Tipton, K. D., & Witard, O. C. (2007). Protein requirements and recommendations for athletes: relevance of ivory tower arguments for practical recommendations. Clinics in Sports Medicine, 26(1), 17-36. 5.) Institute of Medicine. (2005). Dietary Reference Intakes for Energy, Carbohydrate, Fiber, Fat, Fatty Acids, Cholesterol, Protein, and Amino Acids. The National Academies Press. Washington, D.C. 6.) Phillips, S. M. (2012). Dietary protein requirements and adaptive advantages in athletes. British Journal of Nutrition, 108(S2), S158-S167. 7.) Thomas, D. T., Erdman, K. A., & Burke, L. M. (2016). American College of Sports Medicine Joint Position Statement. Nutrition and Athletic Performance. Medicine and Science in Sports and Exercise, 48(3), 543-568. 8.) Norton, L., & Wilson, G. J. (2009). Optimal protein intake to maximize muscle protein synthesis. AgroFood Industry Hi-Tech, 20, 54-57. 9.) Cuthbertson, D., Smith, K., Babraj, J., Leese, G., Waddell, T., Atherton, P., ... & Rennie, M. J. (2005). Anabolic signaling deficits underlie amino acid resistance of wasting, aging muscle. Federation of American Societies for Experimental Biology Journal, 19(3), 422-424. 10.) Smith, K., Barua, J. M., Watt, P. W., Scrimgeour, C. M., & Rennie, M. J. (1992). Flooding with L-[1-13C] leucine stimulates human muscle protein incorporation of continuously infused L-[1-13C] valine. American Journal of Physiology-Endocrinology and Metabolism, 262(3), E372-E376. 11.) Phillips, S. M., Hartman, J. W., & Wilkinson, S. B. (2005). Dietary protein to support anabolism with resistance exercise in young men. Journal of the American College of Nutrition, 24(2), 134S-139S. 12.) Willoughby, D. S., Stout, J. R., & Wilborn, C. D. (2007). Effects of resistance training and protein plus amino acid supplementation on muscle anabolism, mass, and strength. Amino Acids, 32(4), 467-477. 13.) Beelen, M., Koopman, R., Gijsen, A. P., Vandereyt, H., Kies, A. K., Kuipers, H., ... & van Loon, L. J. (2008). Protein coingestion stimulates muscle protein synthesis during resistance-type exercise. American Journal of Physiology-Endocrinology and Metabolism, 295(1), E70-E77. 14.) Burd, N. A., West, D. W., Moore, D. R., Atherton, P. J., Staples, A. W., Prior, T., ... & Phillips, S. M. (2011). Enhanced Amino Acid Sensitivity of Myofibrillar Protein Synthesis Persists for up to 24 h after Resistance Exercise in Young Men. Journal of Nutrition, 141(4), 568-573. 15.) Mamerow, M. M., Mettler, J. A., English, K. L., Casperson, S. L., Arentson-Lantz, E., Sheffield-Moore, M., ... & Paddon-Jones, D. (2014). Dietary Protein Distribution Positively Influences 24-h Muscle Protein Synthesis in Healthy Adults. Journal of Nutrition, 144(6), 876-880. Fundamentally, any change in body composition (e.g. fat loss and muscle gain) is controlled by your daily caloric intake. If you consume more calories than you expend daily, your bodyweight will increase. This scenario is called a positive energy balance. This is where muscle gain occurs. If you consume fewer calories than you expend daily, your bodyweight will decrease. This scenario is called a negative energy balance. This is where fat loss occurs. If you consume the exact amount of calories that you expend daily, your bodyweight will not change. This scenario is called a neutral energy balance. Consuming more calories than you expend daily. To find out how to calculate your daily energy expenditure, check out this article. For many hardgainers, factor #1 does not pose much of a challenge. Training in the gym for 1 hour, 3-4 times per week, can be relatively easy compared to eating enough calories every day to elicit consistent weight gain. The aptly-named hardgainer is an individual who has a hard time gaining weight (muscle or fat). Relatively low percentage of type II muscle fibers (fast twitch) compared to type I (slow twitch). Type II fibers have a greater diameter than type I fibers. Therefore, hardgainers tend to have smaller muscles. Why do Hardgainers have a Hard Time Gaining Muscle? As previously stated, eating enough calories to elicit muscle gain is often challenging for hardgainers. This is primarily due to the hardgainers’ high metabolic rate. There are two individuals of equal body type (i.e. equivalent limb proportions, height, weight, etc. ), but they differ physiologically, and consequentially have different metabolic rates. Individual “A” must consume 2000 calories per day to maintain bodyweight. Individual “B” must consume 3500 calories per day to maintain bodyweight. In order to maintain weight, B must consume 75% more calories than A. If A and B eat the same type of food, B will have to eat almost double the volume of food that A eats. In order to gain muscle mass, B must eat significantly more calories per day compared to A. As a result, B will have a harder time putting on muscle. Metabolic rate, capacity for muscle gain, and morphology (i.e. frame size & shape and limb proportions) are primarily determined by genetics, rendering them unchangeable (at least with today’s technology). Organ size can vary with body size . Larger people tend to have larger organs. This presents an additional challenge for hardgainers as they tend to have an overall smaller frame, potentially limiting their stomach capacity, and therefore limiting their ability to consume large quantities of food relative to larger framed individuals. How much time should the hardgainer spend thinking about genetic limitations? ...none! Hardgainers will succeed in putting on muscle by focusing on what they can change instead of what they can’t. Eat more. Eat more. Eat more. There is no better solution (remember, muscle gain is fundamentally controlled by caloric intake). Hardgainers often underestimate how much food they need to consume in order to gain muscle. If you think you are eating enough to gain muscle, but aren’t gaining muscle…you aren’t eating enough! It’s that simple, but simple things aren’t necessarily easy. Unfortunately, force-feeding is often a tactic that the hardgainer will need to employ in order to gain muscle mass. In order to force-feed as little as possible, hardgainers must include calorie-dense foods in their diet. Calorie density = the amount of calories per unit of food weight or volume. Calorie-dense foods are high in calories relative to their mass and volume, so eating them will have you consuming greater amounts of calories while feeling less full. Peanut butter is an example of a calorie-dense food (166 calories per ounce). Conversely, 0% fat Greek yogurt is an example of a food that is not calorie-dense (17 calories per ounce). Since hardgainers will need to consume a greater amount of calories than most people, they will benefit from buying inexpensive foods to limit the grocery bill. The following is a list of calorie-dense foods that are typically inexpensive, or have inexpensive options. The above list is not meant to be a comprehensive resource for calorie-dense foods; rather, it is meant to help you get some ideas of what you can add to your current diet if you’re a hardgainer. Using a scale to measure your food will help you more accurately determine your daily caloric intake. Measuring your food often isn’t necessary for gaining weight, but if you find that your attempts to put on muscle aren’t working, using a scale will help ensure that you reach your calorie goal. Remember, gaining weight is simply a number game; it’s all about achieving a positive energy balance with your daily caloric intake. Fiber should be an essential part of your diet, but make sure that you do not consume it in excess. Fiber is a zero-calorie nutrient that contributes to the sensation of fullness; eating it in large amounts will have you feeling full while limiting caloric intake (both are counterproductive if your goal is to gain muscle). Don’t completely remove fiber from your diet, but pay attention to nutrition labels so that you can avoid eating large amounts of high-fiber foods. To learn more about fiber and how it interacts with the body, check out this article. Consuming calorie-dense drinks will help boost your caloric intake without contributing much to the sensation of fullness. Drinking a couple shakes per day, in addition to what you already eat, will help you gain muscle. A single shake made with 1 cup of whole milk, 1 oz of whey protein, and 1 oz of peanut butter = ~450 calories. If you drink two of these shakes per day, you will increase your daily caloric intake by nearly 1000 calories. A shake, like the one described above, is essentially an additional meal because it contains a significant amount of calories, carbohydrate, protein, and fat. Limit your intake of pure sugar beverages like soda and juice, as they don’t offer well-rounded nutrition. Fat gain doesn’t just happen overnight, especially for hardgainers. Junk food is both non-filling and calorie-dense. In a pinch, take advantage of less healthy options to help you reach your daily caloric goal, but don’t make it a long-term habit. Don’t think of whey protein as a supplement; think of it as food. Whey contains a significant amount of calories, unlike zero-calorie supplements like creatine, caffeine, and multivitamins. Pound for pound, whey protein is actually significantly more calorie-and-protein-dense than 80% lean ground beef (123 calories/oz compared to 77 calories/oz, respectively). Including whey protein in your diet can help ensure that you reach your calorie and protein requirements for the day; you can easily add it to shakes, water, and oatmeal. Once you find calorie-dense foods that you enjoy, it is best to start buying them in bulk so that you can save money. Buying in bulk also helps save you time because you will take fewer trips to the grocery store. To be able to eat the necessary amount of food to gain weight, you will need to have meals readily available throughout the day. For this reason, it’s best to prepare your food in large quantities. When you eat to gain muscle mass, you go through food much more quickly. Preparing your food in bulk will also help you save time because you will spend less time cooking. The list of sample meals above is only a sample, it is not meant to be a comprehensive diet plan. Be sure to eat a few servings of vegetables daily! Before I started lifting weights and eating to gain muscle I was 6’ and 135 lbs. After two years of disciplined training and eating, I weighed 195 lbs. The rate of weight gain over those 2 years averaged out to be about 2.5 lbs per month, which is a little over half a pound per week. Most of the weight gained was muscle mass, with a small percentage of it being fat tissue. When I started the process of gaining muscle, I was genuinely surprised at the amount of food that I had to eat every day in order to gain weight. I force-fed a lot, and there were many days where I never experienced hunger in any capacity (which is a fortunate problem to have). The more muscle I gained, the more I had to eat to continue gaining muscle. When you add muscle mass to your frame, your daily metabolic rate (i.e. the amount of calories that you burn in a day) increases because a larger physique requires more energy to maintain. To get from 190 to 195 lbs, I had to eat about 4500 calories per day. The heaviest I’ve ever been was about 210 lbs, and to get to that point I had to eat about 5000 calories per day for many months. In my experience, diet is the most challenging aspect of strength training. Going to the gym has never been much of a problem, but having a regimented diet requires consistent effort and planning throughout the day, every day. When I ate to gain muscle mass, I ate a lot of everything: protein, fat, and carbs. I ate plenty of saturated fat and simple carbs. Despite all of this, my routine lipid and glucose tests always came back with excellent results. This doesn’t mean that everyone who eats a high-calorie diet with relatively large proportions of saturated fats and simple carbs won’t experience adverse health effects, as the individual response to such a diet can vary significantly. If you are young, have an active lifestyle, and are adding significant amounts of lean muscle tissue to your frame, your chances of experiencing adverse health effects are lower. The best way to know if your diet is affecting your health is to get blood work from a doctor. Keep in mind that you won’t be on a weight gain diet forever. The “problem” of being a hardgainer can actually be beneficial, depending on your perspective. Hardgainers tend to be relatively lean, and need to worry less about gaining too much fat. Therefore, they can enjoy food more liberally. Hardgainers, once they find the right balance of diet and training, are likely to have an excellent strength-to-bodyweight ratio due to their slender frames and leanness. Having a relatively high percentage of type I muscle fibers means that hardgainers have a physiological advantage for endurance activities. To gain muscle mass, hardgainers must consume more calories than they expend daily. Hardgainers have a difficult time gaining muscle mass because they have a high daily energy expenditure (i.e. metabolic rate) that is genetically determined. To overcome a high metabolic rate, hardgainers must eat a large amount of calories every day. To facilitate a high calorie diet, hardgainers should consume primarily calorie-dense foods. To see appreciable gains in muscle mass, hardgainers must put in a consistent daily effort with their diet. Force-feeding is often necessary for hardgainers to gain muscle.